This Android Studio Error can be quite confusing. “Does it mean my CPU won’t work with Android Studio?”, “Are there other errors within my Android App?”, or are you just frustrated by this ambiguous error message. This article will walk you through the step by step solution in 10 easy steps! As well as other comments, tips, tricks, and videos. 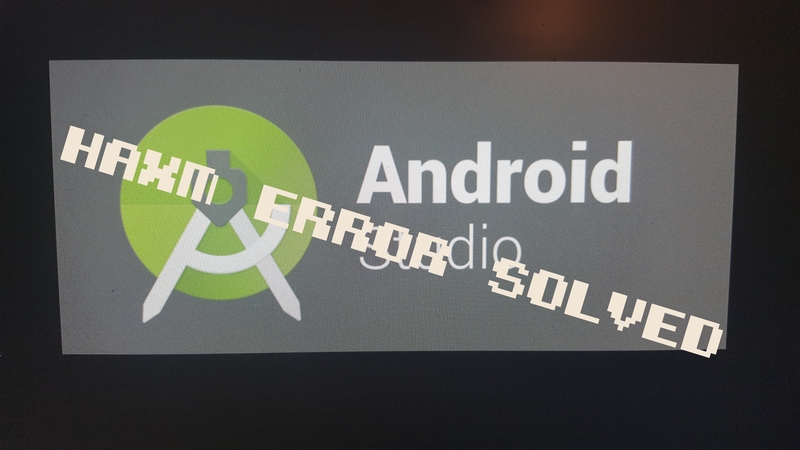 Here is my video on how to solve the AMD Intel HAXM x86 Error for Android Studio. It turns out that for the most part it really isn’t hardware related. The only case where it is a hardware issue is if you don’t have virtualization enabled within the BIOS of your motherboard. The most common issue which causes this issue, is just some setting configurations within the AVD (Android Virtual Device) Manager. Just show me the Fix! Select the Android Device you want to target. NOTE: Your Release Name, Target Version, API Level, and ABI all may be different depending on what Version of Android Studio you are using. But the Key is selecting an arm image for the ABI settings. The AMD CPU can do the virtualization using the arm settings. Should show up as an option within your AVD manager. Press Play on your application. Select your newly named AVD with the ARM image. It should launch an AVD, and initialize the image. (Note since it is the first time it can take some time to load). You may need to enable virtualization within your BIOS to be able to use/run Android Virtual Devices. Gabot, points out that you may have to enable virtualization through the BIOS of your motherboard. The Crazy Fisherman said to check the other tab, if you are having an issue finding the ARM image in the AVD manager. If you are missing the ARM image here are some tips. Here are some tips if you clicked the other tab, but still don’t have an ARM image. I Tried Everything but it Still isn’t Working! If you followed the video to a T, tried all the tips, and then some! AND it still isn’t working for you. Then you should check out GenyMotion. Genymotion, a third party AVD Manager. Here a short video about Genymotion. If you have tried everything and it still won’t work for you, the folks over at Genymotion have built an incredible tool which makes running Android Emulations just awesome. Genymotion has some pretty nice features. It gives access to the camera, you can test how you app behaves depending on battery levels, access to GPS, and is compatible with Linix, Mac, and Windows. When I used Genymotion I was quite impressed by the quality those guys put into this product. Sometimes working with Android Studio can be quite a pain especially when it gives you an error as long as “emulator: ERROR: x86 emulation currently requires hardware acceleration! Please ensure Intel HAXM is properly installed and usable. CPU acceleration status: HAXM kernel module is not installed!” This can be such a pain, however if you followed the ten steps it should have solved your issues. 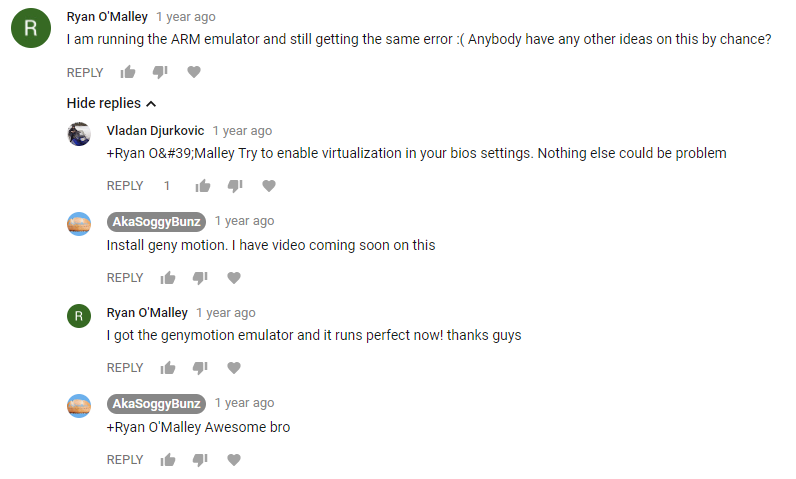 If not try checking your BIOS settings, or installing Genymotion. Leave a comment below if you have tried all these things and still nothing fixes it for you, or if you were having issues and found a solution. By being a community we can help each other solve these crazy errors. Again, I want to say thank you to everyone who left such positive comments, likes, and shares on this video. This single video has motivated me so much into making more content for you guys! Thank you! Hey Youtube Akasoggybunz here, and in this video I’m going to show you how to fix the problem. If you get the error x86 emulation currently requires hardware acceleration, please ensure Intel haxm is properly, installed and usable. And then it says your cpu acceleration status blah blah blah blah blah. Okay, so what I was reading. I was like man this is really confusing, because I have virtualization enabled on my processor. Then I got thinking about it, and went looking through the forms. They tell you to click on the AVD manager. I am sorry I don’t remember the link. The Link says to go to the SDK manager, and then they tell you to go to the SD SDK tools. Then they say make sure you have Intel x86 emulator accelerator HAXM installer version 5.5 installed. Now if you do have an Intel CPU and you are getting this error. This might be your fix to just simply go into your SDK manager click on SD SDK tools, click on Intel x86 emulator accelerator, and then if it’s not install click on install. But as you can see I have it installed currently, but if you look when I press play. I choose that emulator now. If you’re not sure how to make the emulator we’re going to go over that in just a minute. So I choose the emulator, and I look still I’ll look error x86 emulation currently requires hardware acceleration. I’m like ok and then other tutorials say to go into your BIOS and make sure virtualization is enabled. If you look at my other videos you can tell I have Virtual-box. Virtualization is needed to run a virtual machine, so virtualization is enabled on my BIOS. So again if you’re running Intel go ahead click that’s SDK manager make sure you have that installed. Then go on your BIOS make sure you have virtualization enabled. For me I’m running an AMD processor, and just to just to show you that I’m running the AMD processor. I’ll pull up the properties real quick and you can see I’m running an AMD FX 6300 6 core processor. I’m not running Intel that’s our problem. After digging, and digging, and digging, and digging in the forms… I wish I remembered what form it was in. I would have given the credit. The way to fix this problem if you’re not running on an Intel CPU. Is you click on a video, then you go click a click on create virtual device. Pick whatever device you’re using to emulate. I want to emulate the Nexus 5 since that’s what I am going to develop on and then click Next. Then once you get into system image, this is where you you make it make the change instead of doing an x86 processor or the x86 64. Click on the ARM processor arm a EA bi then go ahead and click Next. Then just do just to show you well name this one Nexus 5 if you got two or three tests and then we’ll go ahead and we’ll finish that and then it’ll save a the AVD. OK, so if you look it’s right here so we’ll get go ahead we’ll just close that so now when we press play it asks us which emulator we want to use we’ll pick the one we just made Nexus 5 API 23 test, and then press OK. Since it’s the first time running it it’s going to take a while, so I’ll probably speed up this process. Okay so now that the emulator is done installing we’ll go ahead and just launch the app that I’m working on just to show you that it works. So just go ahead click the Run button, and then if you notice down here in the console we’re not getting the error anymore. So now it’s going to be sending it to the to the emulator, and there it goes it launches. So just remember it is if you have an AMD CPU, and it’s not working. It’s because you just need to use the arm emulator. If you guys liked the video go ahead and like it. Leave a comment in the comments section below. If you have any questions go ahead check out the website. I’ll probably post a link on that in the description too, and thanks for watching! This issue I’m having is that Google wants my apps to be compatible with Oreo and there’s no Android 8.0 emulator that doesn’t use x86. Thus this “work around” doesn’t help as I cannot test if my app will work on Oreo. Are you saying that with Android 8.0 you are not able to get this to work on an AMD processor? That is interesting. I am sorry to hear that. Have you tried using Genymotion? Or do you have an android device that you can debug directly on? I believe you can also change your target Android versions in Android Studio. If I remember correctly you can change the minimum target. Hey dude, now I have a working device!!! Thank you thank you!!!!!!!! !